In 2011, the KPS World Language Department partnered with World Leadership School (http://www.worldleadershipschool.com/) of Denver, CO, to organize an exciting Spanish-language and cultural immersion experience in Chilamate, Costa Rica, while incorporating elements of service learning, leadership development, and of course, adventure. The mission of World Leadership School is to empower young leaders to find new and innovative approaches to the world’s most pressing problems. 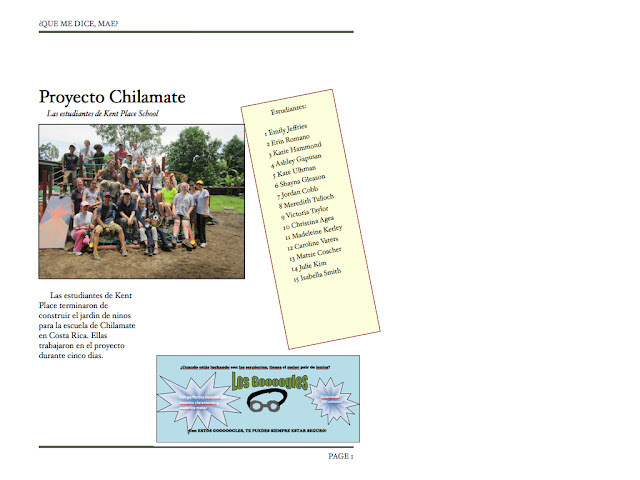 As a result, in June 2011, 15 students and 4 chaperones had a memorable – and hands-on – experience in biodiversity-rich Costa Rica, while laying the groundwork for a lasting partnership in Chilamate. To learn more about the 2011 trip and their playground construction project, see http://kentplace-costarica-2011.blogspot.com/. Currently, 10 new students – led by Dr. Katharine MacCornack (World Language) and Ms. Heather Lukeman (Science) – are preparing for their upcoming adventure, March 9-18. On this trip, the service projects will include the construction of a computer lab that will benefit our partner school in Chilamate, as well as the local community. The KPS group will be accompanied by two faculty members from the World Leadership School. Stay tuned for on-trip blog updates, pictures and videos!! !